The mere mention of cockroaches brings about a strong reaction in many people. However, the fast moving, shiny, black or brown cockroaches commonly encountered by people in their homes are almost never native Australian cockroaches, but introduced pests. The native Australian fauna is diverse, and rarely encountered by those who don’t venture far from urban areas. In fact, most of the Australian cockroach fauna will avoid human contact, preferring instead to forage among the vegetation, leaf litter and soil of undisturbed habitats. 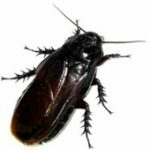 Cockroaches are an ancient group, having remained relatively unchanged for hundreds of millions of years. 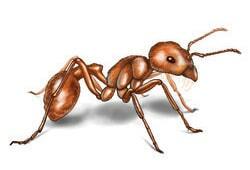 They have a flattened body, long antennae and bristly legs. They have specialised sensors called ‘cerci’ (which are like rear-mounted antennae) that make them acutely aware of their surroundings. Any sign of danger sends them scuttling away. They also have the ability to eat almost anything. This is a great advantage when competing with other species for food. Over the course of a year some female cockroaches can produce over 20,000 young. Their sheer numbers and indiscriminate feeding habits mean they may spread disease-causing organisms, although there is very little evidence to suggest this actually happens. They do, however, cause strong allergic reactions in some people. 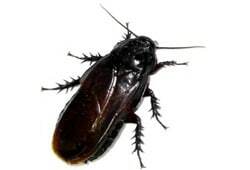 Worldwide there are around 4,000 species of cockroaches. 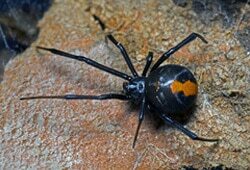 Approximately 450 of these are found in Australia. 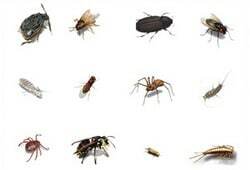 In Australia, only five species are considered pests. 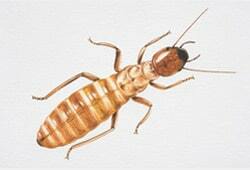 The five pest species have become scavenging experts and have a long association with humans. In fact, some scientists believe that as early humans left Africa to colonise the world, cockroaches were probably not far behind. Cockroaches have downward facing triangular-shaped heads. Their eyes are situated at the upper corners of the triangle and the mouth at the bottom corner. The head is partly or often completely concealed beneath thorax (mid-body). The body is usually flattened and elliptical in shape, with all the legs similar in shape and specialized for running or for digging. Many Australian species are wingless in one or both sexes and some species have reduced wings. Winged forms fly readily when disturbed. Australian cockroaches range in length from 3 mm – 70 mm long. Some species are brightly coloured, with orange, red, yellow and even blue present. Many of the brightest species are also day-active, being found on leaves and bushes in sunlight. One Australian species (Polyzosteria mitchelli) has transparent windows in the upper skin, although it is not known why. Pest species are often flattened dorso-ventrally (from back to front) and are usually dark brown. Habitat and BiologyMost cockroaches lay their eggs within a protective case called an ootheca. The ootheca may be carried for some time by the female before being deposited on the ground or buried in the soil. Cockroaches of the family Blaberidae and Blattellidae, however display a few different reproductive strategies. Some push out the ootheca, but rather than depositing it somewhere, they retract it back into a uterus or brood sac where the eggs develop. Other species of Blaberidae do not form an ootheca but let the eggs pass directly from the ovipositor to the uterus where they develop. One species, Pycnoscelus surinamensis, reproduces parthenogenetically (without males) though males are occasionally born. Cockroach oothecae are subject to parasitism by various groups of wasps. Some of which produce a single wasp adult per ootheca and some produce many more. Adult cockroaches are subject to predation by other invertebrates, birds, lizards, frogs and mammals as well as parasitism by round worms and wasps. Some species produce defensive secretions to ward off attackers, while other species can roll themselves into a ball to protect themselves. The introduced species can often be found in sewers and around garbage, from where they can convey contaminated material into dwellings. Additionally, many introduced species carry bacteria such as Salmonella in their gut, which they can pass on through their saliva and faeces. One Australian cockroach has been listed as an endangered species. The Lord Howe Island Woodeating Cockroach (Panesthia sp) is a wingless burrowing species which may have been wiped out following the introduction of rats to the island. Roth, L.M. 1991. Blattodea. In: Naumann et al. (eds.) Insects of Australia. Melbourne University Press, Australia. Rentz, D. 1996. Order Blattodea: Cockroaches. Chapter 14 in Grasshopper Country. UNSW Press, Sydney.